1) I wear jeans about 99% of the time in Winter. Reason? Pale legs (which I actually don't mind as much as I used to). And the fact that once you stumble upon that elusive perfect pair, you don't want to take them off. Ever. 2) My style is quite simple. I love girls who love to follow the latest trends and who never seem to fear anything in fashion. I however like simplicity. I've made enough mistakes to know what works for me and what doesn't. I'm trying to step out of my comfort zone as often as I can, but I'll never tire of classic lines and shapes. 3) I really don't like posing for the camera this way. I keep asking boyfriend to take pictures, but so far it hasn't happened. 4) Neutrals are my best friends. 5) I'm obsessed with stripes. 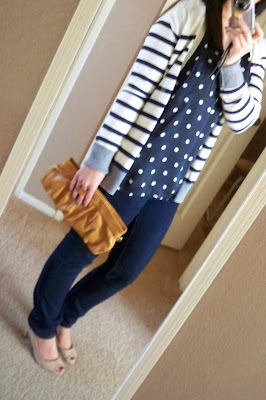 Polka dots are sure to follow this Spring. On another maddening note, the YSL Lapis Arty I ordered has been cancelled! It isn't in stock anymore, and I am furious! Yes, I am being overly dramatic. It's not the end of the world. The hunt is on, Readers. It's on. I think the best style tip is knowing what works for you and sticking to it! And maaaajor bummer about the ysl ring! Good luck with the hunt! Oh God I would freak out over the YSL ring for sure. You're definetly not being overly dramatic in my eyes! Natasha: Thank you, I hope I can eventually get my little hands on it! Southern Domestic Bliss: Cute blog name =) And thank you for understanding! 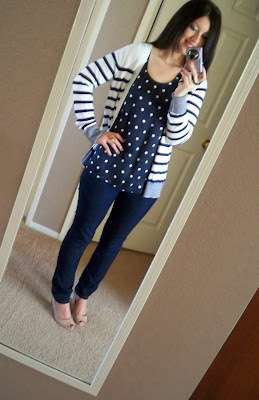 omg love how you put the stripes and polka dot together!! i'm going to have to try that it's so cute on you! If it makes you feel any better, the pink one I ordered was not as pictured on the web site so I'm returning it (it has stripes in it which I was not expecting), disappointing. You wore it! Looks cute! Had so much fun with you last night! Good times good times! :) Good luck hunting that ring! Natasha xoxo: Thank you for doing some research for me, I really appreciate it! I checked and they don't have the lapis unfortunately =( I'll keep checking back though because I hope they get more in stock! Have a great weekend. Aww man! I am so bummed for you because I loved that ring. Loving the spots and striped together and the pop of yellow in the clutch, you are so cute!!! Ashley J: Thank you sweetie. I'll find the ring eventually! The polka dots and stripes look amazing together!